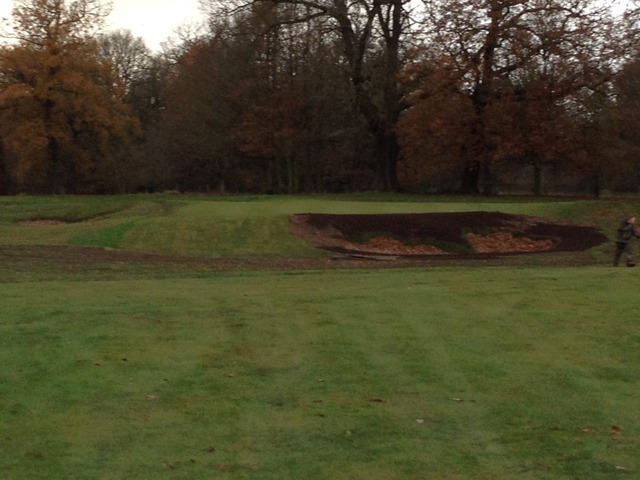 The Bunkers are now all turfed and ready to have the linings put in in January. After a visit to the Belfry the sand has been ordered and it will be the same as in the Brabazon course and the PGA National. 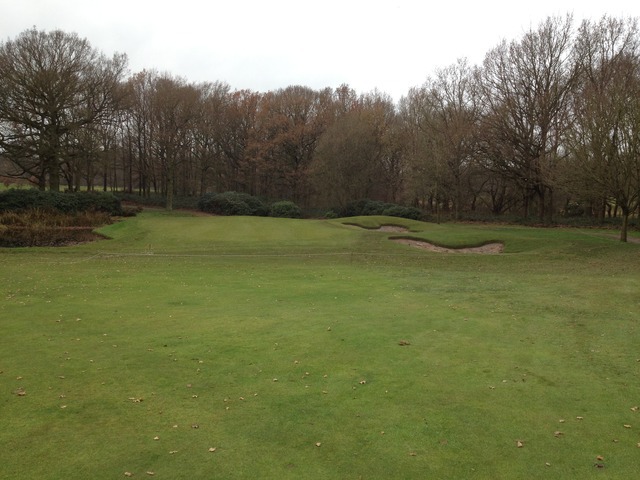 The left hand fairway bunker on hole 1 100 yards short of the green. 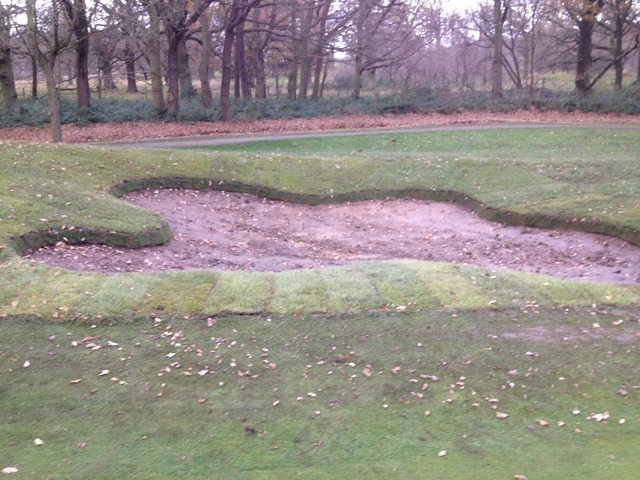 The left hand bunker with the turf blocks laid. The bunker to the left of 11 green with the turf blocks in. A drain is in the process of being dug. 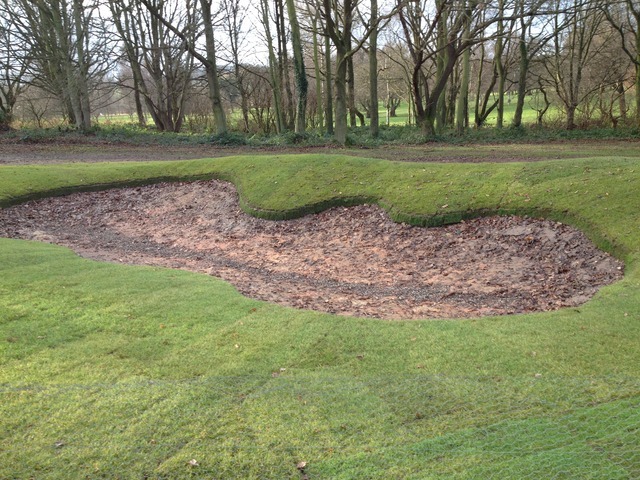 The turfing of the bunkers on the 1st hole is complete. The focus today has been on completing the greenside bunkers on 10 to allow the hole to be open on a temporary green for the weekend. 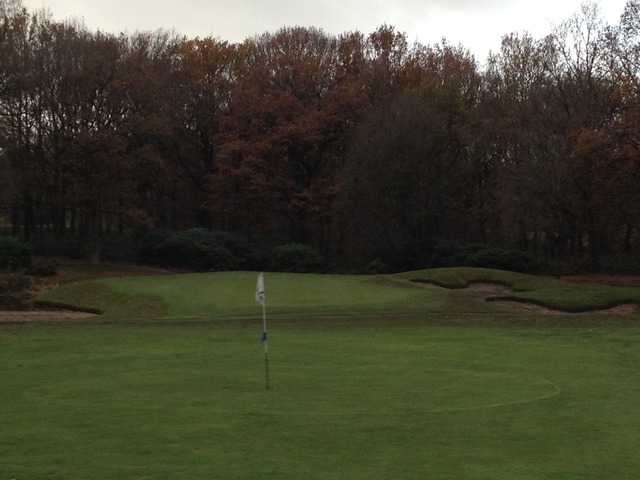 The bunker to the left of the 11th green. The shaper has finished on site today and the greenstaff will be working hard to reinstate the course over the coming weeks. 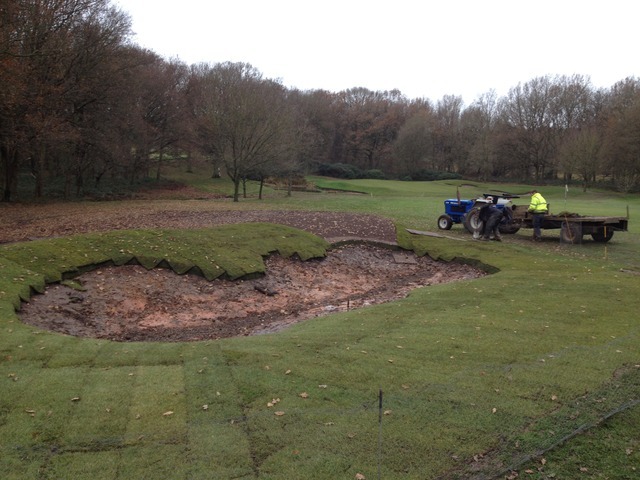 The turf blocks are in place in the fairway bunker right of 10 fairway and the drain to the left has been filled and returfed. All the bunkers that are scheduled to be done are nearing completion and we anticipate that Tom will be on site to sign them off with the shaper tomorrow. We are three days ahead of the schedule. 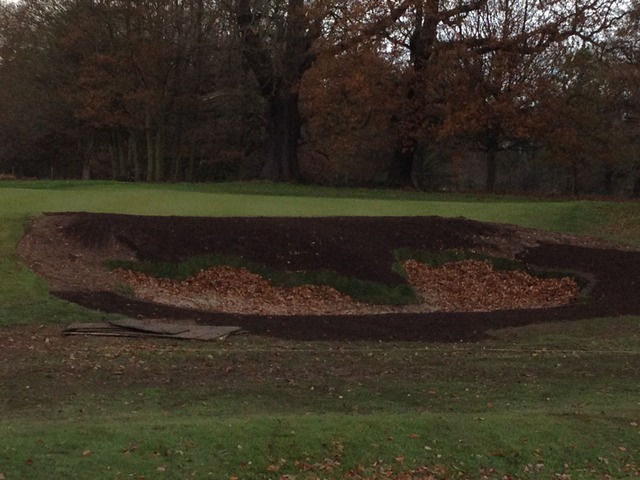 The greenstaff have lot of work to do to complete the returfing of the bunker surrounds before Christmas. Tomorrow holes 10,11 and 12 will be closed and the temporary 6th hole ( stroke index 11 for comp) in play As you can see from the photos holes 10 and 11 are not fit or safe to play. 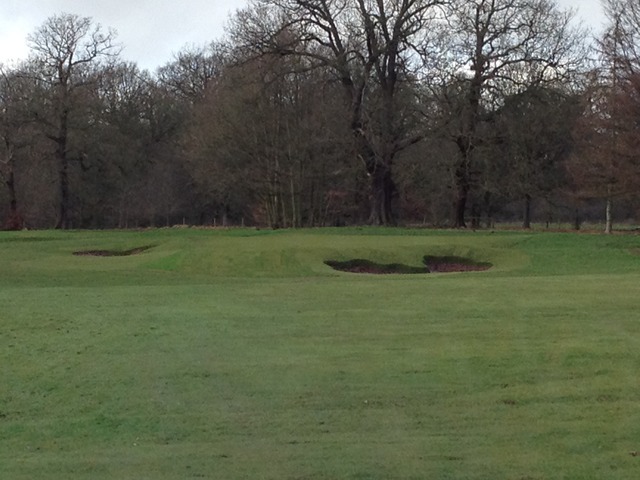 The right fairway bunker is visible, it has been designed to allow a well struck shot to clear it but it will catch a poor strike, the carry is approx 250yards from the back tee. The fairway is going to be widened to the left for the golfer who wishes to play a safe tee shot but will face a second shot with the water coming more into play. 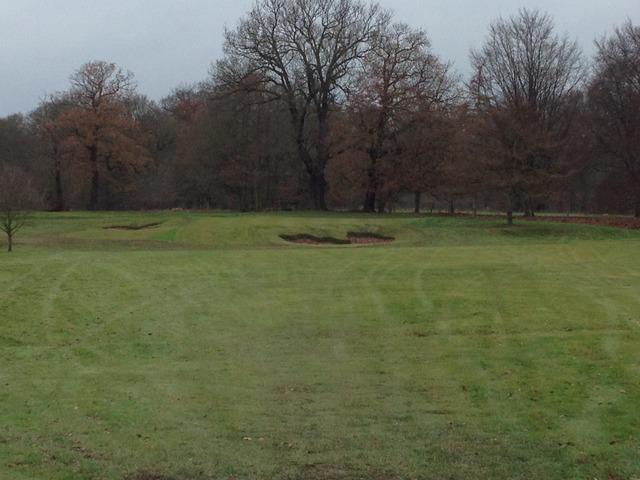 After the rain and hail this morning the photograph of the left 10th fairway bunker shows the wet clay soil, the trench is for the plastic pipe which will then be gravel filled to carry the water away from the bunker. Chicken wire has been erected around the bunkers to stop balls running in. If your ball is in a new bunker area please don't walk across the new turf, the greenkeeper will collect the balls and they can be retrieved from the Professionals shop the next day. 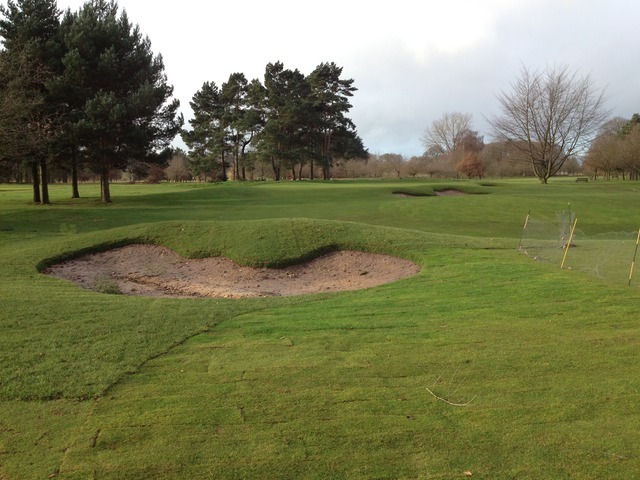 The newly turfed areas and the new bunkers on hole 1,10 and 11 defined by the chicken mesh and new turf are ground under repair from which play is prohibited . If a player’s ball lies in the area, or if it interferes with the player’s stance or the area of his intended swing, the player must take relief under Rule 25-1. The bunker front right of the 1st green is almost finished.It requires lining and filling with sand. The blocks in the first left fairway bunker on hole 1. It looks a daunting shot from a misplaced drive!!! 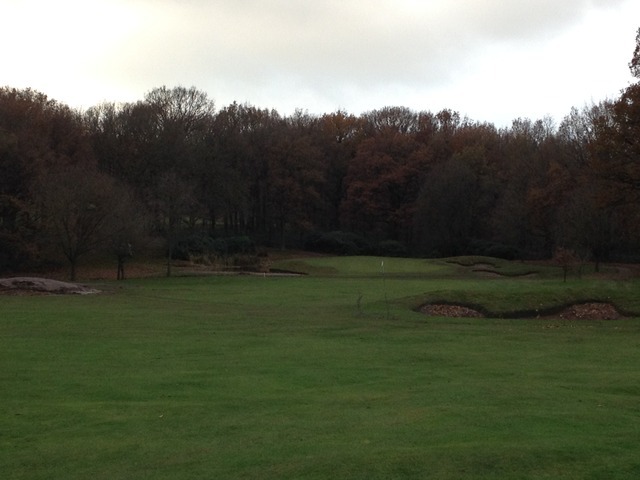 A view from the tee the gap seems very narrow a straight drive is no required!! Paul taking a bow!!! or is he cutting turf? 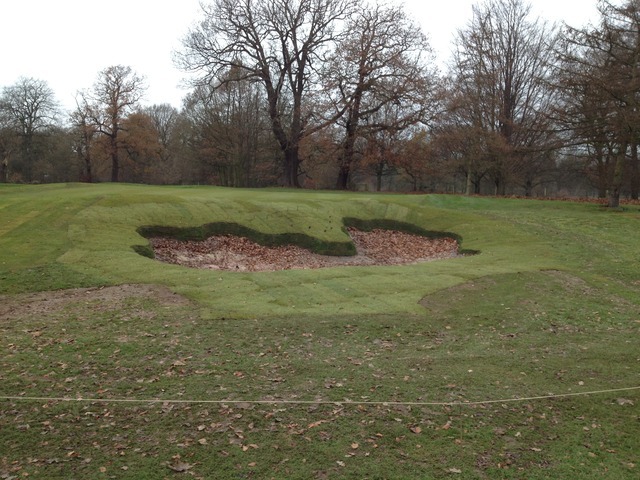 A view from the middle of the drive zone- the greenside bunkers have been completed and the turf relaid where the old bunker was. 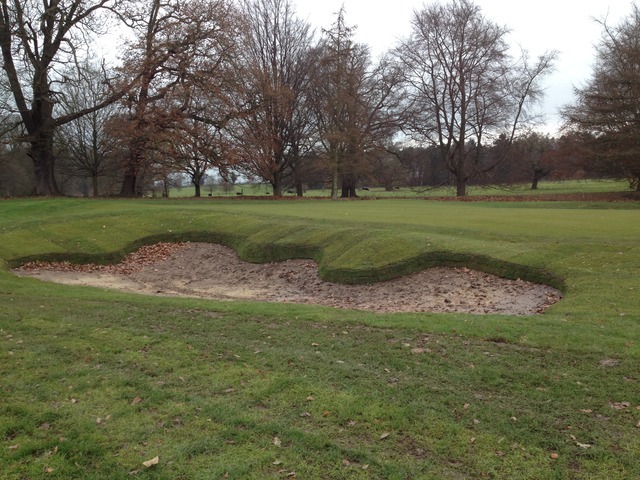 The left hand drive zone bunker reshaped, topsoil applied and ready for turfing. 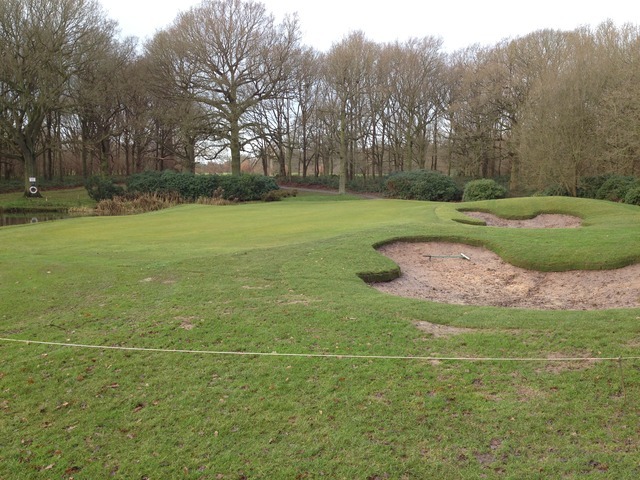 The picture shows the reshaping of the land where the bunker short right of the green was. Note the lack of top soil and how dry the soil is under the turf.